Stitch Story: The Mademoiselle Crochet Necklace Pattern En Español! The Mademoiselle Crochet Necklace Pattern En Español! There is nothing more flattering than when someone likes your design enough to download the pattern, buy yarn, and spend their time making it. One step further is translating the pattern into another language so even more people can enjoy the pattern! I recently made the fun discovery that someone has translated the Mademoiselle Necklace pattern, into Spanish. I was just working with the yarn I used for this necklace, Berroco Comfort Sock yarn, yesterday. It is a favorite of mine for crocheting jewelry. It is soft and comfortable to wear, and it comes in some lovely shades. 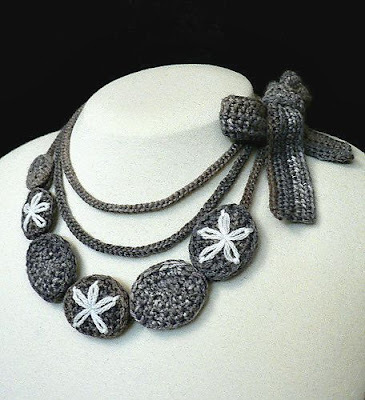 This necklace has so many elements I love, the triple strands, the crocheted beads that you thread onto the strand, the embroidery embellishment, and of course the bow! That is why I am happy that it can reach a new audience! I hope there will be many more Mademoiselle necklaces made in the world!